I am back in the kitchen and this time with a savory tart. 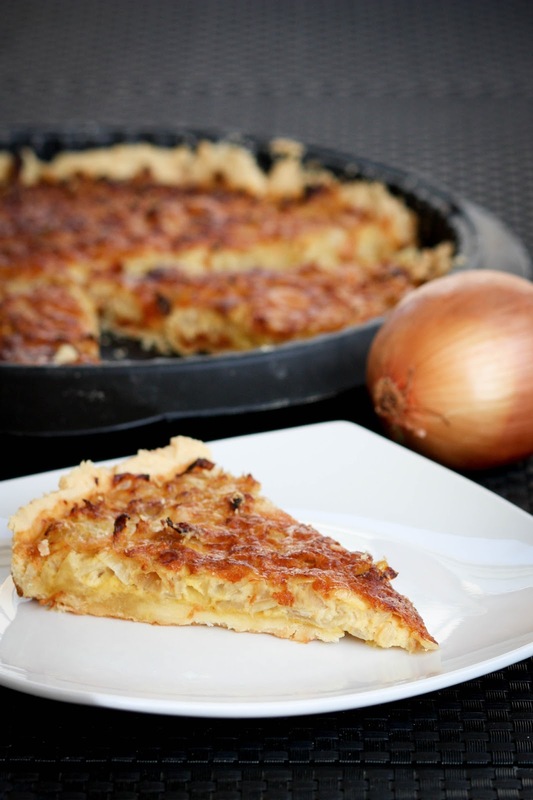 Those who are following me on Facebook, read about my little onion tart experience a while ago. 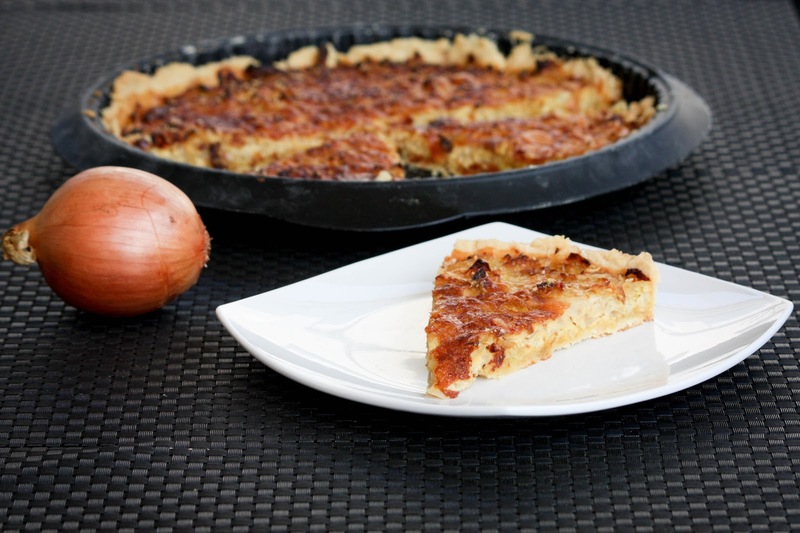 I really do love onions and this tart definitely made my day. It is not too much work and you can play with the taste as much as you like. For instance the recipe indicates to use mustard. I used the standard mustard, but I have already decided that next time I’ll use a much spicier version. Because the sweetness of the onions combined with the spiciness of the mustard make a perfect match. 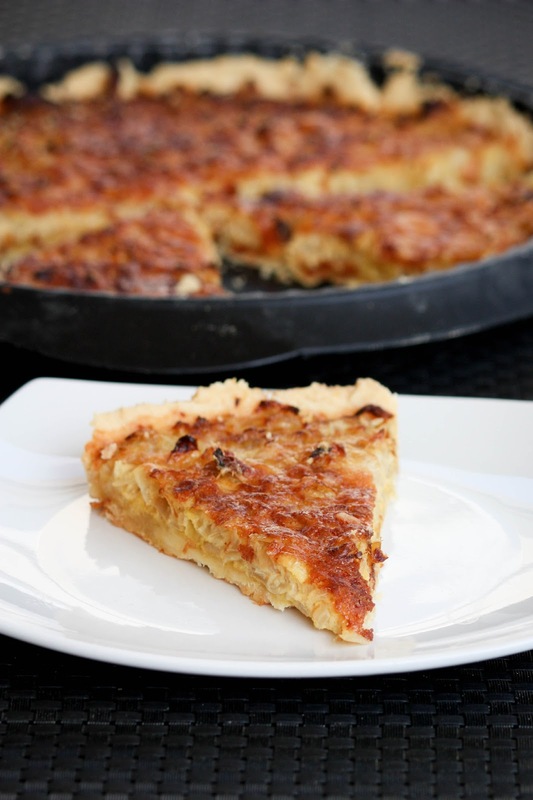 What I especially like about this tart is that even it contains liquid cream and onions; it’s still not too heavy for a summer day. 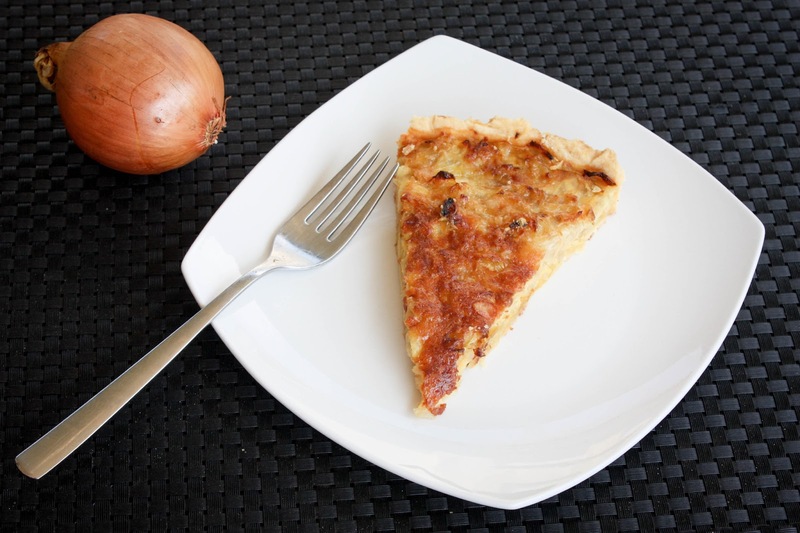 I was not sure if I shouldn’t go for a tomato mozzarella quiche or a tomato pesto pie, but in the end, my love for onions pushed me to give it a try. 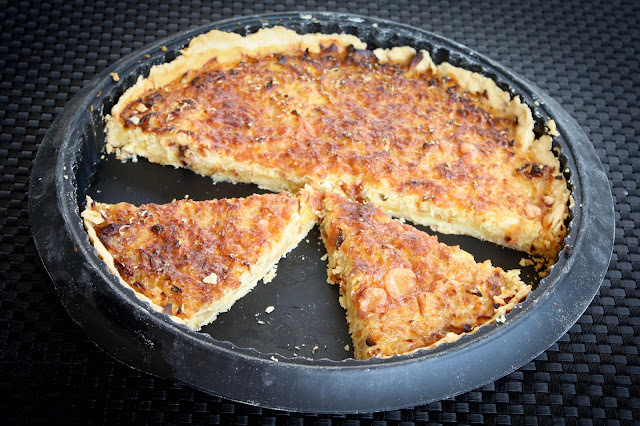 The little amount of cheese allows you to eat the tart cold as well. For those who like to eat spicy, I suggest to use wasabi paste instead of mustard. I will definitely try this version as well. The wasabi paste is not a substitute for standard mustard, but for those who like it hot, they should try this version as well. I recently transformed an ordinary recipe with a wasabi touch, and the outcome was perfect. I will investigate on this part a little more, and come back to you with more options. I was lucky; I had a great kitchen assistant this time. While I was taking care of the dough, my boyfriend was cutting the onions. The preparation of the tart/quiche is not that challenging, but I find it’s always more fun to cook together. So for the future, when I need a fast and efficient vegetable cutter I might ask for help again. When it comes to preparing savory dishes I realized that I am much less patient before tasting, and this makes the whole food photography part much more difficult. Looking at a nice smelling treat and not being allowed to touch until the shooting is finished almost makes a torture out of the whole process. I figured that I should rather shoot what I will have for dinner straight after lunch, so the temptation is much smaller and the result of the photography obviously much better. In order to prepare the dough, pour the flour and a pinch of salt on the countertop. Cut the butter into little cubes and add it to the flour. Then start kneading it with your fingertips until you get crumbly dough. Dump the crumbs back on the countertop, mounded high like a mountain. Then at the top push and scrape out the flout until it looks like a volcano. Add the water to this well and knead the dough fairly quickly before forming a ball out of it. Wrap it into cling film and refrigerate for 20 minutes. After 20 minutes take the dough out of the refrigerator and roll it out. Shape it depending your base and transfer it to it. Now you shall cover the dough with baking paper and refrigerate it once more for 20 minutes. Take the base out of the fridge and bake for 10 minutes. Take the baking paper off the dough and bake again for 10 minutes until it gets golden brown. Spread the baked dough with mustard. Add the onions. In a middle-sized bowl whisk together the eggs and the cream. Pour this mix over the onions. 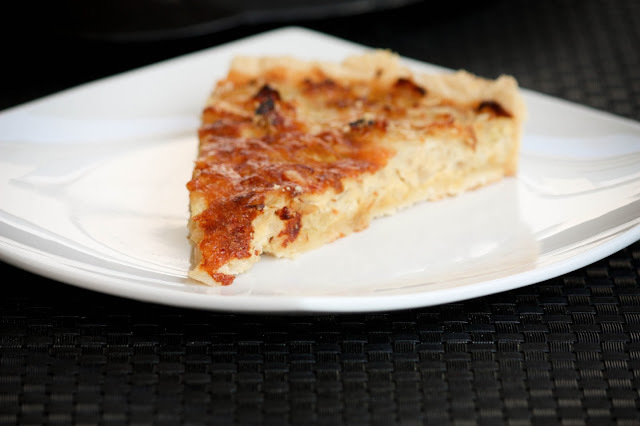 Finally scatter the tart with the Parmesan.